Looking at another Group for Adults with Learning Disabilities – Part 1. When I went to Keswick, one of the joys was meeting people who went to other Prospects (now Livability) groups and talking about how we all do things similarly or differently. So I thought that you all would like to hear what goes on in other groups too. We at the Good News Group have developed our own way of doing things but anyone who runs a group or wants to set up their own can develop their own routines and styles. We all use accessible communication, inclusion and Bible discipleship as our basis. Our first interview is with Helen and her team at the group, called SHINE, that meets in Worthing on the South coast. Who are you and how did you come into this role of supporting adults with learning disabilities in church? I’m Helen – I first came into this role when I was part of a church in Milton Keynes. I returned from 3 years away working for a Christian organisation in another part of the country and found that we had been joined by a lady called Debby with a learning disability who had recently moved to the UK from South Africa following the death of her father, to live nearer to her mother. I noticed that, while Debby had been welcomed into the church she had no Christian friends who shared her challenges, while having many friends at College who did not share her faith. I knew about Prospects, having prayed for many years right from the time when David Potter was setting up the charity, and contacted them to see if there was a group in our area. The nearest at that time was in Bedford, so for ten years Debby and I commuted each month to their meetings. I had the joy of seeing her grow in her faith and in her confidence as a member of the church, meanwhile I was learning how to support people in church, and in particular helping to lead worship in the group. After ten years of prayer, we were both part of the team which set up a group in Milton Keynes – still going strong today. I went on to be involved in Prospects team at Spring Harvest, and in the team leading the weekend at Highleigh every other year. So naturally when I moved to Worthing on retirement, I became involved in the group here, and now lead the team. What is your group called? How long has it been going? When, where, how often does it meet? How many people come? Our group is called Shine. It has been going for 13 years and meets monthly at Worthing Baptist Church in Christchurch Road, usually on the 3rd Sunday afternoon of the month, at 3pm. Around 20 people usually come, most with some form of learning or other disability, others just wanting to support us while enjoying an accessible meeting. What do you do in a typical meeting? Our meetings take the form of a simple service, with the format having changed little over the 13 years. We start each meeting with the lighting of a candle and singing our “theme” song Shine, Jesus, Shine. We sing other songs through the meeting, including at least one which those who wish can do a simple dance to, and also sing the Lord’s Prayer each time using Ishmael’s version “Dear Lord, our Father who’s in Heaven”. As well as an opening prayer, often led by a group member, we have a time for members to share news or concerns and to be prayed for. We have a reading – if from the New Testament, we now use the new Accessible NIrV version, bought for us by a group member. 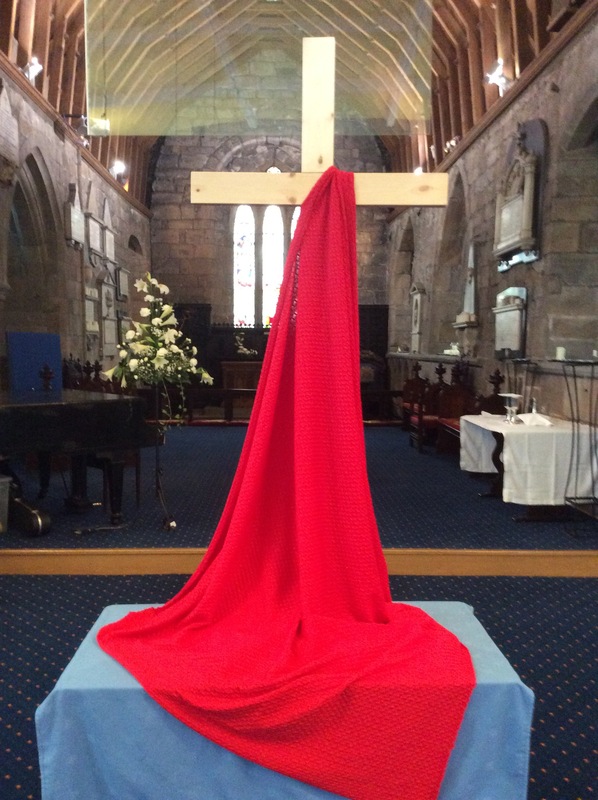 A recent “innovation” for us is the introduction of an offering – the group have really appreciated the opportunity both to give as part of their worship and to play a part in the support of the activities in this way. Teaching may take the form of a short talk, a drama, or a combination of the two and, following a relevant song, we will then take a few minutes to consider how we can all apply what we have learned in our daily lives – this may take the form of a short talk, or interactive whole group discussion, or where appropriate there may be an active response such as bringing items symbolically to the Cross. Before our final song we celebrate any birthdays happening that month with a card and a song. Our meetings finish with afternoon tea together – our sandwiches and cake are legendary! How did you or others go about starting up the group? The group came about when Marilyn Reading (now Marilyn Yarwood) moved to Worthing on the appointment of her late husband Samuel as Minister of Worthing Baptist Church. Having worked with Prospects at Spring Harvest and Keswick, Marilyn was keen to get involved with a local group and asked Tony Phelps-Jones and Pete Winmill if there was a group in Worthing. There was not, and so the suggestion came back – “why don’t you get a meeting together to see if you can start one?”. So Marilyn wrote to all the local churches to ask if anyone would be interested in starting a group. The Minutes of the WBChurch meeting of July 2003 record that she had been asked to call a meeting – those of September 2003, that 20 people attended, and a training day was to be held, and in early 2004 it was recorded that this had also been well attended and the group was to start that year (it started in May 2004). How do you enable people with learning disabilities to understand the gospel / Bible? Simple teaching, aiming at short, clear and specific delivery of talks; drama; use of relevant songs; clear reference back to the reading – and encouraging people to ask questions both in the meeting and one-to-one afterwards. What can you tell us about the faith of PLD in your group? Are there examples you’d like to share? Growing! As we have over the last couple of years encouraged more of the members to play a bigger part in aspects of the meetings “delivered” by the team, so we have seen them spontaneously gather round someone who is distressed or concerned about something and pray for them, rather than call one of us over to do it. We also hear reports of them praying for each other when they meet at other groups! One member, who has severe dyslexia as well as other learning difficulties, and fragile mental and physical health, spent two years working through the Salvation Army’s “Battle Orders” course (challenging for anyone!) in order to qualify to become a Soldier (full member). She achieved this this year, and was commissioned in a wonderful service attended by our team, and by Pete & Christine Winmill. Already a member of the local Night Shelter team, she has now become a member of the Shine team, having met all the criteria of our safeguarding policy as well as clearly being a great role model and mentor to others in the group. How does your church family support the group? The group is not formally part of any particular church family as team members come from a number of local churches, as do those members who are part of a church – most are, and we are encouraging the rest as they become more confident to link with a church near them. Having said that, Worthing Baptist Church, our host church provides meeting space, and all other facilities we need free of charge (we do make sure we give them a love offering each year!) – and the support for myself as leader, and the other team members and group members who are part of the church is fantastic – we ask for prayer through the church news sheet each month, and many members ask for prayer needs in between, group members who attend the church are specifically encouraged in their faith, and the ministers seek to make their preaching accessible to all by keeping terminology as simple as possible, and explaining clearly when less clear terminology is needed. What could your church do to support your group further? We do hope to have some younger team members join us – most of the team are over 70 years old, so the question of succession is a real one! Our church is very open to encouraging those who sense a call to join us, and we hope over the next year to have the means in place to seek the same support from other churches in the area – while not wishing to lay ourselves open to the issues which can arise from launching a “recruitment campaign” of any sort! We believe our safeguarding policy will help in this – and here I must pay tribute to help received from the local Baptist Association safeguarding Lead who has been incredibly supportive and helpful. What is your church like for accessibility? What are they wanting to improve? In terms of welcome, support, care with language etc very good. Physically we have issues in that our halls are not accessible to anyone who cannot manage steps, and so activities are limited to the sanctuary and welcome area (which thankfully does include loos!). This is an issue for the church as a whole and one of many building-related challenges we are seeking to address as a church. What advice would you give to someone wanting to set up a Livability type group in their church or area? Thank you Helen and the Team. We pray that your group will grow in love and fellowship, knowledge and grace. In Jesus Name. Amen. This week is the Church of England’s week of prayer. Our church has organised daily prayer events as has many across the world. Do look at the website “Thy Kingdom Come” and social media for examples of what churches are doing. Please do share it and use it in your church to show people that prayer is for everyone. I wish you’d been there as we filmed it. Each person involved was so keen and capable. They delivered their ‘line’ often the first take was perfect and the whole group was excited as we played it to them the next week. In our church’s week of prayer we were included in hosting a prayer meeting, as we always are. I was sent this leaflet about Prayer Stations and thought that we could easily adapt these ideas to suit our group and their communication needs. So here are our stations and how we did it. Using a wooden cross we gave people the opportunity to write, draw or put symbols onto post its and stick them on the cross. We had parts of the Lord’s prayer to reflect on as well as instructions supported by Communicate in Print. This reminded people that Jesus is the Light of the World. I had a disco bulb which fitted perfectly under the balcony of church and shone the moving light onto the ceiling. This was great for our sensory adults. This station invited people to write names other friends onto a piece of paper and peg it onto a piece of string tied across the posts. Lots of people helped each other say and write names on this. This station was to pray for our world. We placed wooden crosses on the map of the world and prayed for that country. I kept all the prayers I wrote for our country after Brexit and thought that we ought still to be praying for our country. This table left out a selection of those prayers and invited people to pray for our nation, especially ‘Thy Kingdom come’! We put out our prayer trees on the tables so people could go back to them and those who didn’t want to walk around the church for long or at all could still pray in an accessible way. You know by now that we are about ABILTY not disability. There’s no reason why you can’t do these things too. Go on, try some new inclusive prayer ideas and care with us what you do. In Jesus Name…always and forever…Amen.